At Cushie Audio we’ve spoken to thousands of customers who have invested in Bluetooth car kits, many of who have used Parrot Bluetooth products before switching to another brand like GROM or Dension. We decided to look further into the differences between the products, to give consumers a better idea of what suits their car kit needs best. Why Invest in a Bluetooth Car Kit? First of all, why should you even invest your money into a Bluetooth car kit? Is it really worth it? Being on your mobile phone whilst driving is against the law in every state of Australia. Mobile phone distraction can lead to devastating accidents, which is why even touching it while driving is illegal. Having a Bluetooth car kit makes taking calls over your car’s speakers easy, convenient and legal. You don’t need to worry about taking your eyes off the road to take or make calls, you can have conversations over the phone all the way from point A to point B! Another popular benefit to having in car Bluetooth is the ability to stream your own music. With more people using their phone as their source of music, you can listen to your favourite tracks easily just by streaming through Bluetooth. But with so many Bluetooth car kits available, which one should you pick? Because Bluetooth relies on a wireless connection you need a good quality product that will make sure you can listen to crisp audio, whether it be your music or phone call. Let’s jump in on the comparisons. The Parrot MKi9100 is an installed car kit, meaning that it’s physically wired to your car stereo. It allows you to stream music via bluetooth, as well as handsfree calls.. 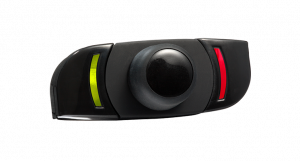 It connects to your audio system and comes with a remote to stick on to your steering wheel or wherever is convenient and safe. You should be able to control everything from the remote without having touch your phone. Parrot claim that you can even keep your phone in your pocket and expect great reception. You only need to use the user-independent voice recognition to find who it is you are wanting to call and you should be connected in seconds without echo or in-car noises. 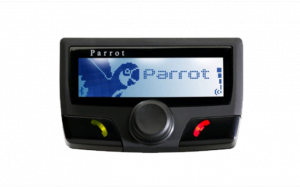 When it comes to music, the Parrot MKi9100 is compatible with iPhones/iPods, USB MP3 players and devices with line-in input. It can also connect to Bluetooth Stereo sources. 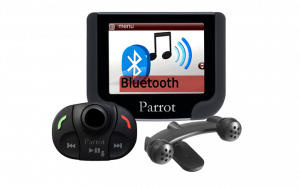 Consumer feedback on the music quality from Parrot MKi9100 has been both positive and negative, with a few reviews reporting the music sounding “tinny”. The MKi9100 is also meant to sync your phone contacts and update every time a new phone number is added to your phone. However, some reviewers state they had problems getting all of their contacts uploaded. Reviewers have also stated that the voice control can be quite poor. The remote gives you access to main functions with your music, but it has also faced criticism with many saying that it can break easily and be expensive to replace. The problems have ranged from buttons just not working altogether to LED lights not working, making it difficult to use at night. Sometimes it makes it impossible to end calls with it being unreliable. There are a few things that set the MKi9200 apart from the MKi9100, the most noticeable difference would be the LED screen. The 9200 has a full-colour screen that shows playlist and LP covers, caller ID, wallpaper, phone book and menu, and settings. Unfortunately, users have reported the same problems as the 9100 with the bluetooth connection being poor and music sounding tinny. If you want to make calls, it seems to be alright, but it drops slightly in the music department. The remote issues have not been fixed either, and they tend to run through batteries quickly. 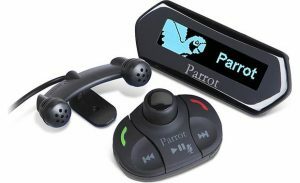 The Parrot CK3000 is a small Bluetooth car kit that is said to install in every car model but only works with most mobile phones (iPhone, Samsung, Nokia, LG, Sony Ericsson and Blackberry). It can be paired with up to three phones and will store up to 150 names from your contacts. You will need to voice-train it to be able to make your calls hands-free, and you can also use voice commands to pick up and end calls. There are no added bells or whistles. There are no LED screens to look at and use. It is just a small device that connects automatically to your phone when you turn the ignition. This car kit is for calls only and not for music, and for what it is, it is an acceptable Bluetooth car kit. The downside is that some car stereos that don’t have ISO connectors need a special lead, and that lead can be expensive. You have to program every number into the phone, and re-recording information about an existing contact can be a downright pain. Finally, while you may get good, clear calls, the microphone is nothing special and can pick up on background noises easily. The Parrot CK3100, like the CK3000, is a Bluetooth car kit just for phone calls. It has an LCD screen that works as a caller ID and will mute the radio when a call is in progress. The CK3100 works with all Bluetooth enabled mobile phones and can support up to five of them. When you connect your phone to the CK3100, your phonebook, as well as call log, is transferred over but you will have to voice tag all of them in order to use voice dialing. If you add a new contact, it should automatically be updated on the CK3100, but there have been times where that has not happened. Some people have had problems with the “hang up” command and have found themselves having to do it manually. 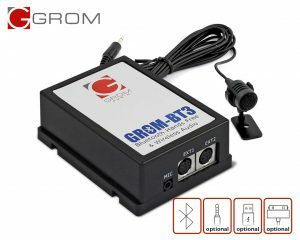 GROM BT3 is a great Bluetooth car kit that will enable hands-free phone usage as well as clear streaming audio. You can voice dial calls and use your car’s existing stereo controls on the console or steering wheel to control music and calls when in CD changer mode. Your music playback will pause when a call comes in, and it is designed to reduce background noise and echo. Listen to your favourite tunes with the Bluetooth Audio playback (A2DP), while easily controlling your music with existing steering wheel or stereo buttons. There are two extension ports where you can add on auxiliary input, USB charging or even digital radio. This device will work with all Apple and Android phones. In fact, iPhone owners have said they can ask Siri questions, get directions and read emails through the speakers. You don’t need a professional to install the GROM Audio BT3. Users love how easy it is to install (often less than 30 minutes). There is also a lot of praise for the clear audio and the fact that there is no interference and you don’t have to worry about the signal dropping out. The GROM Audio BT3 delivers on all its promises. 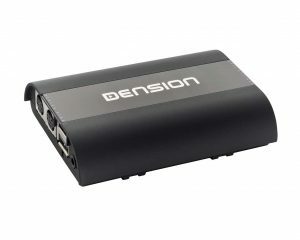 Dension is a name synonymous with great audio products, and the Gateway Lite BT being no exception. Reviewers often report that it does more than they thought it would. It plays music through Bluetooth and USB, as well as optional support for iPod/iPhone via cable and auxiliary input. Skip through your songs and start/end calls using your stereo or steering wheel track control buttons. Some compatible Toyotas and BMWs will even display text on the stereo consoles. Like the GROM, it is straightforward to install and DIY friendly. 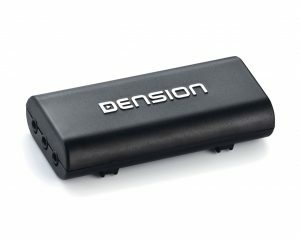 Reviews sing the praises of the Dension Gateway Lite BT, with one consumer saying, “I can’t believe that I have spent so long searching and using other options before I got this.” Bluetooth calls are clear without dropping out, and the external microphone picks up on your voice without picking up the road noise. Dension continues to live up to its name with their Gateway Pro BT. This device has text display, which means you’ll get phone book browsing, caller ID and call lists shown on the car display. All of your song titles will be shown as well. The Dension Gateway Pro even supports multiple languages! And the sound quality? “Fantastic” as some of our reviewers have said. Installation is easy and can usually be done by yourself, however some European cars may require programming. Like the Lite version, you can use the steering wheel controls to skip through songs and even playlists. Dension is a great company, who pride themselves on the quality of their products. It’s a little box that does everything you need it to do with crystal clear sound without the interference that will last you a long time. The Compact BT is a simple and universally compatible Bluetooth solution over FM or AUX. This small device will deliver high-quality audio to any car, connecting to your car via FM transmission or AUX input. It’s designed to be concealed behind the dash, with a high quality microphone to be mounted in the car. You’ll get song information on RDS text capable stereos when connected through FM transmission. You’ll find installing the Dension Compact BT simple, although it does require wiring to a power source. 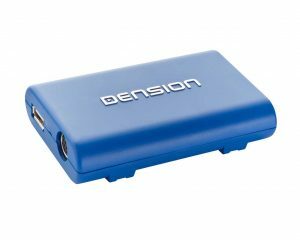 If you want a simple, straightforward way to play music through the FM transmission or AUX but still get amazing quality audio and a reliable transmission, then the Dension Compact BT is a great choice. We believe that if you are looking to invest in a Bluetooth car kit, then you might as well get a tried and trusted solution. Cushie Audio only believe in supplying our customers with the best, which is why we offer the GROM and Dension car kits. They’re fully integrated into the car, not just tapped into the speakers – which not only means better quality audio, but fully integrated with the car. This means you don’t need to depend on a remote that can break easily, or one you need to make sure you have batteries for. You also don’t need a professional to install a GROM or Dension Bluetooth car kit. Our kits are easy to install yourself, and you can be ready to go within 30 minutes. We pride ourselves on excellent customer service, so if you ever ran into a problem we’re here to answer any question you have. Most people find installation quick and easy, but in the rare event you should find a problem, we’re here to help. For a quality product that is fully integrated and does the job, go for a GROM or Dension Bluetooth car kit over a Parrot. Like so many other customers, you’ll be glad you did!